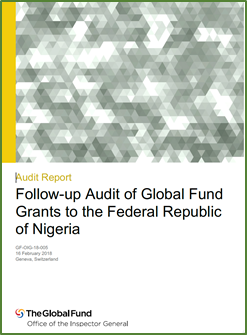 There have been significant improvements since the last audit, but there are still many problems that need to be resolved, the Office of the Inspector General (OIG) says, referring to a follow-up audit of Global Fund grants to Nigeria recently completed. Some of the risk mitigation measures that have been implemented need more time to become effective, the OIG added. A report on the follow-up audit was published in 16 February. The previous audit was conducted in 2015. The feedback section contains comments on the audit from some of the organizations mentioned in the OIG’s report. The follow-up audit covered the period from July 2016 to September 2017. The Global Fund considers Nigeria to be a “mission-critical country.” At $674.7 million, Nigeria’s 2017–2019 allocation was the largest of any country. Since 2003, the Global Fund has committed over $2.0 billion to Nigeria and disbursed over $1.8 billion. See Table 1 for a list of the grants that were active at the time of the audit. Notes: (a) The grants have some activities supporting health systems. (b) All grants had an end date of 31 December 2017. (c) At the time of the audit, no new grants for 2018–2020 had yet been approved. Just over half of the grant resources are allocated to procuring medicines and other health products. Nigeria is a lower-middle-income country with a population of 184 million people, the highest in Africa. Nigeria has a three-tier system of government, composed of the federal government, 36 states and 774 local government areas. The country has a multi-ethnic and culturally diverse society. With an abundance of natural resources, Nigeria is Africa’s biggest oil exporter and it also has the largest natural gas reserves on the continent. Nigeria has the highest malaria burden in the world; the second highest HIV burden; and it is one of the top ten countries with the highest TB burden. Nigeria ranked 152nd out of the 188 countries in the 2016 UNDP’s Human Development Index report. Transparency International’s 2016 Corruption Perceptions Index ranked Nigeria 136th out of 176 countries. Nigeria continues to face security challenges in the northern states, which affect the implementation of grant activities. Nigeria’s grant portfolio has had more than its share of problems. Part of the country is classified as a challenging operating environment; and Nigeria’s grants are being managed under the Additional Safeguard Policy (ASP). Despite the challenges, Nigeria has made progress against the three diseases. Programs supported by the Global Fund have saved the lives of 1.7 million people as of end 2016. Between 2000 and 2016, deaths from malaria dropped by 43%. Incidence of HIV declined by 37% between 2000 and 2016. With the support of the Global Fund, Nigeria passed the one million mark for people on antiretroviral therapy (ART) in 2017. In addition, in 2017, the Fund financed the distribution of 14 million mosquito nets in six states over a five-month period, covering an estimated 28 million beneficiaries. OIG comments: The increase in the size of the country team as well as the quarterly program reviews have resulted in improved grant oversight. The changes in the implementation arrangements have improved the management of the HIV grant but there are gaps under the malaria grant. OIG comments: The overall assurance framework has improved with a balance between prevention and detection measures. However, the Fiscal Agent, who is a key mitigation measure is not consistently effective. There are also opportunities to improve efficiency in assurance arrangement. The Global Fund has instituted antifraud measures since the last audit but it is too early to be able to evaluate their impact. OIG comments: There have been improvements in inventory management, availability and accountability of medicines across the supply chain. However, challenges in underlying data, roles and responsibility between the service provider and principal recipient, and the Secretariat’s management of the service provider require improvement. Increased resources to manage the Nigeria portfolio. The number of staff in the Secretariat assigned to the Nigeria portfolio has increased from nine to 19 since the 2015 audit, the OIG reported. In addition, the country team has instituted quarterly programmatic reviews to discuss grant implementation and related challenges with in-country stakeholders. Improved implementation arrangements for the HIV program. The OIG said that the appointment of Family Health International 360 (FHI360) as a new principal recipient (PR), to assume responsibility for many of the activities previously managed by the National Agency for the Control of AIDS (NACA), has improved the function of the HIV program. Awarding a grant to Lagos State, as a pilot project, the OIG stated, is another positive development. The grant was signed in January 2017 but experienced delays due to challenges in disbursements at the state level. More time is needed for this grant to achieve its full potential, the OIG said. Strengthened financial management and assurance. The Secretariat has improved how fiduciary risks are managed, the OIG said, and has “generally found the right balance between prevention and detection controls.” In addition, the OIG said, the Secretariat has enhanced coordination among assurance providers; has developed risk and control matrices; and has streamlined and enhanced external audit arrangements. Anti-fraud measures have improved since the 2015 audit, the OIG said. The Secretariat revised the fiscal agent’s terms of reference, which has resulted in the addition of fraud specialists to the fiscal agent’s team. More time is needed to measure the effectiveness of the anti-fraud measures, the OIG stated. Improved supply chain activities at the central level. The Global Fund has implemented measures which have resulted in improved storage, inventory management and accountability for medicines at the central warehouse. the supply chain is not yet fully effective and efficient. The audit found that although the Global Fund has made significant changes in the implementation arrangements for the HIV program to address the weaknesses identified in the 2015 audit, there are gaps in the implementation of the malaria program due to capacity constraints of a new PR, Catholic Relief Services (CRS). The grant managed by CRS had been reprogrammed to focus on bed net distribution for six states in 2017. CRS had limited experience in managing such a large grant in Nigeria and had only 12 months to get the job done, the OIG said. The anticipated support by its regional and global offices that have experience in bed net distribution did not materialize. This resulted in delays which the OIG said had to be mitigated by the country team and in-country partners by hiring a local NGO, the Society for Family Health, to manage distribution in two states. The OIG acknowledged that all 14 million bed nets were distributed in 2017. In addition, the OIG explained, CRS had planned to implement three of the six mass distribution campaigns through the use of mobile technology –– which was one of the reasons CRS was selected. However, the technology could not be used for any of the campaigns even though about $3.0 million was spent on procuring mobile phones and related equipment. The problem was caused by inconsistencies in the description of the devices in the PR’s request for a customs waiver, which resulted in the authorities confiscating the devices for five months. The plan is to use the technology during the next grant period. In addition, the implementation arrangements for the next grant period have been revised: Three new sub-recipients (SRs) will be engaged. Regarding the grant to Lagos State, the OIG said that although the state model is a laudable approach, it presents unique challenges that need to be continuously monitored and mitigated. For example, the OIG said, there were delays in disbursements. Funds received from the Global Fund in February 2017 could not be used by the PR until April 2017 due to protracted approvals at the state level. This delayed the recruitment of key staff. The engagement of international NGOs as PRs is expected to improve management of the grant and the timely implementation of activities. The OIG acknowledged that there was an urgent need to get implementation on track. However, the OIG said, there is also a need to build the capacity of the states’ disease programs to ensure sustainability. The OIG noted that the states have responsibility over the health facilities due to the federal structure of the country, and that this limits the ability of PRs at the central level to have leverage at the lower level of implementation. The Secretariat has improved the portfolio’s programmatic assurance framework, the OIG said; however, further enhancements are required in program oversight and assurance at country level, and in management of the portfolio by the Secretariat. At the country level, the OIG said, there is currently no guidance on the role of the country coordinating mechanism (CCM) in countries under the ASP, especially when new PRs are selected by the Secretariat. In Nigeria, the two new PRs were engaged by the Secretariat, which limits the ability of the CCM to hold them accountable. In addition, the OIG said, conflict of interest and capacity constraints have negatively affected CCM performance. The audit identified problems with the review of documents submitted to the Secretariat by implementers, especially for the TB grants, the OIG revealed. Some of the problems related to the poor quality of the documents, but there were also delays in the response of the Secretariat to requests from the country. The OIG noted that the TB program is significantly behind schedule in achieving its targets. The Secretariat will submit revised guidance on CCM roles and responsibilities for countries under the ASP. Based on the approved guidance, the Secretariat will set specific expectations for the Nigeria CCM. The audit found that the fiscal agent’s reviews are not consistently effective and efficient due to gaps in its quality assurance process and the Secretariat’s oversight. Although the fiscal agent is a critical component of the risk mitigation measures for the portfolio, the OIG said, the agent does not consistently identify material gaps in controls and payments requests from the implementers. In addition, there are delays in the agent’s review of the payment requests due to gaps in the quality of documents submitted by implementers and inefficiencies in the agent’s processes. The OIG said that there is a need to reassess the balance between financial assurance and program implementation. The fiscal agent currently reviews all transactions at selected implementers regardless of the amounts involved. The OIG said that 26% of the transactions were below $250. In addition, the current assurance framework requires third-party supporting documentation for the $100-a-month payments to each of 106 community-based organization (CBO) implementers. The OIG said that this money goes into a pool of resources to support the CBOs, which makes it difficult for them to allocate the supporting documentation specifically to the Global Fund grant. This has delayed implementation of activities by the CBOs. The OIG said that the country team had identified the problem and had considered potential mitigation measures, including those suggested by the fiscal agent, but the Secretariat decided not to take any action. the lack of systems and tools for the Secretariat to evaluate the performance of fiscal agents. develop a corporate approach on the performance management of fiscal agents. The audit found that the Secretariat has significantly improved the management of the risk of fraud in the Nigeria portfolio, but that more time is needed to fully evaluate the impact of these efforts. Following the 2015 audit, and an independent financial control review conducted by a public accounting firm in 2016, the terms of reference of the fiscal agent were revised to incorporate fraud prevention and detection measures. This resulted in the addition of fraud specialists to the fiscal agent’s team, the OIG reported. The fraud specialists have supported the PRs in developing comprehensive anti-fraud policies and procedures, including internal mechanisms for reporting suspected fraud, the OIG said. For most of the PRs, fraud risk registers have been developed that identify and address gaps in controls. The non-fraud specialists in the fiscal agent’s team and internal audit units of the PRs are being trained on fraud risks and provided with fraud tools, the OIG stated. Although there have been improvements in fraud prevention, the OIG said, there is a need to improve fraud detection and reporting. The audit found that the Secretariat is addressing the supply chain challenges identified in the 2015 audit. Hiring Chemonics to manage the storage and distribution of HIV and malaria medicines on behalf of the PRs has improved storage, inventory management and accountability for medicines at the central and zonal warehouses, the OIG said. In addition, the Global Fund is working with in-country partners and the government to integrate the existing vertical supply chain systems under the National Supply Chain Integration Project. As well, the OIG said, medicines and health products received from the Global Fund’s Pooled Procurement Mechanism can be reconciled and traced; storage conditions and practices at the central level were in accordance with World Health Organization (WHO) guidelines; and TB and multi-drug-resistant TB medicines are also appropriately managed by the Association for Reproductive and Family Health and the Institute of Human Virology Nigeria. Gaps in distribution arrangements. There are gaps in delineating the roles and responsibilities of the PRs and Chemonics. During the January 2017 distribution cycle, an incomplete request from the PRs left more than 40 primary health care facilities in Kano State without rapid diagnostic kits for 30 days. At the same time, Chemonics did not consistently distribute the requested medicines to the facilities; some get more than what they requested, others less. Weak management of expired medicines. This was a problem in the 2015 audit and, despite some improvements, it remains a problem. In the five warehouses managed by Chemonics, the OIG estimated that 1,580 cubic meters of space (approximately 1,090 pallets) was being occupied by expired medicines. The Global Fund is being charged, on average, $84,000 a year for warehousing expired products. All seven health facilities visited by the OIG had expiries which have taken over some storage space (e.g. about 40% of the space in the Rainbow Hospital and Maternity facility). Subsequent to the audit, the Secretariat has incorporated waste management in its contract with Chemonics to enable it to retrieve expired medicines from the health facilities for destruction. Inadequate inventory management practices at facility level. Although significant improvements have been made at the central level, the same cannot be said for the facility level. However, the OIG acknowledged that the government and partners have key roles to play in addressing inventory challenges at the health facilities. Delays in customs clearance. If not addressed, these delays could result in stock-outs. There was a stock-out of anti-malaria medicines and commodities at the central level in 2017 for a period of four months, which triggered emergency procurement by the Global Fund. Secretariat’s monitoring of Chemonic’s performance inadequate. The key performance indicators (KPIs) related to warehousing are adequate, but the distribution KPIs cover only “on time” and not “in full.” Subsequent to the audit, the Secretariat revised the distribution KPIs. The Secretariat will clarify the roles and responsibilities of the PRs and Chemonics in the distribution process and will conduct a dissemination session to ensure that relevant parties understand their role in the process. The OIG identified gaps in internal controls on the quality of data in the health facilities, which was also an issue in 2015 audit. The OIG acknowledged that this is a national challenge, and that more time and joint efforts from all stakeholders are required to address the problem. “Progress in this area is also highly contingent on the Government of Nigeria and its willingness to increase the level of its investments in health systems,” the OIG observed. The OIG said that there have been delays in the roll-out of the Strengthening National Health Management Information System project –– delays that were due to the suspension of grant activities in 2016 and subsequent challenges in recruiting a technical service organization to lead the roll-out. The OIG reported that during the planning phase of this follow-up audit, the Secretariat acknowledged that the data quality challenges at health facilities are yet to be resolved. Given the lack of progress on this issue, the OIG said, it has not performed additional work as part of the audit. The OIG indicated that the government has refunded the $5.8 million in recoverable amounts identified from previous OIG audit and investigations. Wijnroks said that in response to challenges described with the malaria grants, the Secretariat and the PRs have revised the implementation arrangements for 2018–2020, including the engagement of experienced SRs…. “As a result of this proactive engagement, all 2017 objectives for the malaria program were fully met,” she stated. Wijnroks said that the Global Fund now has significantly greater assurance that medicines and other health products are available to patients when and where they need them –– thanks partially to the establishment of 37 logistics coordination management units, one in each state, which focus on improving timeliness and accuracy of supply chain data. “We also repositioned short-dated TB and malaria medicines and other health commodities, resulting in the use of life saving commodities that would otherwise [have] been at risk of expiry,” Wijnroks said. On 13 December, the Board approved two malaria grants to Nigeria (see GFO article). The CCM is expected to submit a revised TB/HIV funding request in Window 5, on 30 April 2018; the Technical Review Panel had recommended that the original request, submitted in Window 2 in May 2017, be sent back for iteration. We provided organizations mentioned in the OIG’s report with an opportunity to comment on the report’s findings. The following responses were received. FHI360 Global Fund project transition from the inherited Microsoft Excel–based reporting to electronic platform (DHIS) that reduces data entry error and promotes timely reporting of program achievement across supported entities. This is evident in the three of our program areas (HIV counselling and testing, PMTCT, ART) which had an over 90% reporting rate as at the time of the OIG review. Implementation of the LFA data quality audit recommendations: Part of FHI360’s effort prior to OIG audit in 2017 was ensuring adequate supply of M&E tools to the service delivery points in response to tools shortage at service delivery points (SDPs) as identified by the LFA. All the newly revised national [tools] were printed, distributed to SDPs; and the capacity of the healthcare workers in the SDPs built on these tools. Quarterly conduct of data verification and quality assessment exercises were carried out. Data verification exercises were conducted four times during the life of the project. Three were conducted before the OIG audit period. Action points were developed from these exercises and management letters sent to defaulting SRs. Editor’s note: A spokesperson for the OIG told Aidspan that there may have been a misunderstanding: The finding in Section 1.3 that Pandey is referring to, he said, did not relate to FHI 360’s work but to the data quality at a national level. “This finding has also been communicated to the country and all stakeholders throughout the reporting process and acknowledged by the country coordinating mechanism, headed by the Minister of Health,” the spokesperson said. "Data quality remains a challenge on the portfolio. A significant issue identified in the previous OIG audit that still remains largely outstanding relates to the gaps in the internal controls over data quality across the health facilities. This was partly because relevant data registers were either not available or not appropriately used. The supervision and related controls over programmatic data had also been found inadequate by the OIG in 2015. The OIG acknowledges that this is a national challenge, and more time and joint effort from all stakeholders are required to be able to address data quality issues. Progress in this area is also highly contingent on the Government of Nigeria and its willingness to increase the level of its investments in health systems." “Catholic Relief Services (CRS) appreciates the opportunity to share reflections following the recent release of a report by the OIG on Nigeria. CRS expresses full support of the OIG, and values the collaboration we have had this past year, specifically on strengthening fraud management systems as well as audit consultations on the performance of the Global Fund malaria grant in Nigeria. CRS is proud of the success of this one-year project –– valued at $103m plus $40m in bed nets –– launching the initiative in a very short time frame, in a complex context and environment. We met the challenge expressed by the Global Fund Secretariat to prioritize this grant as an institution, and CRS executives and field leadership embraced an all-agency approach. We mobilized many headquarters, regional and global experts and management staff who worked for months in-country with existing and newly-hired staff up to launch project activities. All efforts were made to engage stakeholders, plan jointly, identify viable logistics and warehousing arrangements, and also explore local institutions to carry out key activities where capacity existed (e.g. with Society for Family Health [SFH], for bed net distributions). “The results speak for themselves: As a new PR in the country, CRS quickly built strong relationships with the National Malaria Elimination Programme (NMEP), Ministry of Health leadership and staff, state governors, civil society and faith-based leaders; and all came together to successfully distribute 14 million bed nets over a five month period. All parties –– including the Nigerian Government and the Global Fund Secretariat –– have expressed a high level of satisfaction in the project’s achievements and results which benefitted nearly 28 million Nigerian women, men and children. CRS congratulates all government and non-government partners for making a challenging transition, embracing new roles and responsibilities, and overcoming new obstacles.